The Winterport Water District is a quasi-municipal water and sewer utility located in Waldo County Maine. The utility district provides public drinking water, fire protection services, & wastewater treatment of domestic sewerage to the citizens of Winterport. The two charges on your water bill provide the District with the funding it needs to transport clean, potable water to your home, and also to carry wastewater away from your home for treatment and eventual release into the Penobscot River. Customers are charged on a 'user pay' basis, meaning you only pay for the water you use - the more you use, the higher your water use charge. Sewer fees on your water bill pay for the ongoing maintenance and operation of sanitary sewer lines, and the treatment and eventual release of wastewater into the Penobscot River. The more water you use, the more wastewater the District has to treat and release. 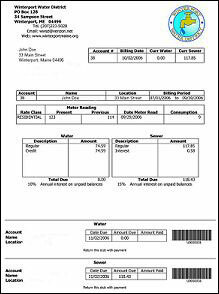 Therefore, your sewage fees are based on the reading of your water meter of your total water charge.